Lucas Davidson’s work explores the transitory nature of self. Davidson’s work is concerned with metaphysical dualities such as presence and absence, material and immaterial, internal and external. Davidson has drawn upon meditation practice in the series ‘Present Absence’ to investigate the transition between the embodied and disembodied experience. There is difficulty in accurately articulating the impact the unconscious has on our conscious self. The work aims to visually represent this relationship, demonstrating the importance the absence of being weighs on the physical body. ‘Present Absence’ aims to highlight how the anonymous quality of the absent body adds a visceral dimension to the lived body. Using a technique that dissolves photographic emulsion in water, the portrait photo becomes a transparent flexible form that represents the fluidity between the conscious and unconscious state. Davidson has been developing this technique over the past year and uses a diverse range of mediums including photography, video and installation to capture this process. 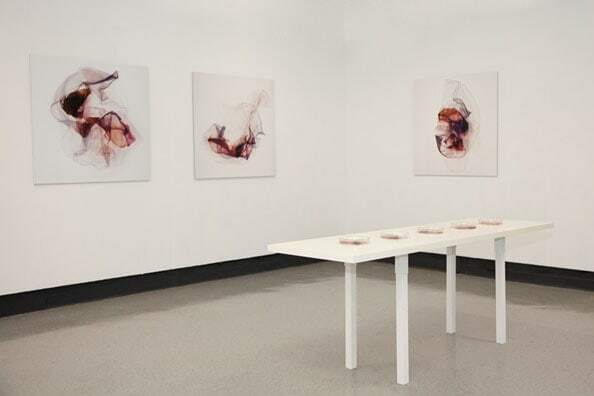 Lucas Davidson has completed his Master of Studio Art and is continuing with his Master of Fine Arts degree at Sydney College of the Arts, Sydney University.